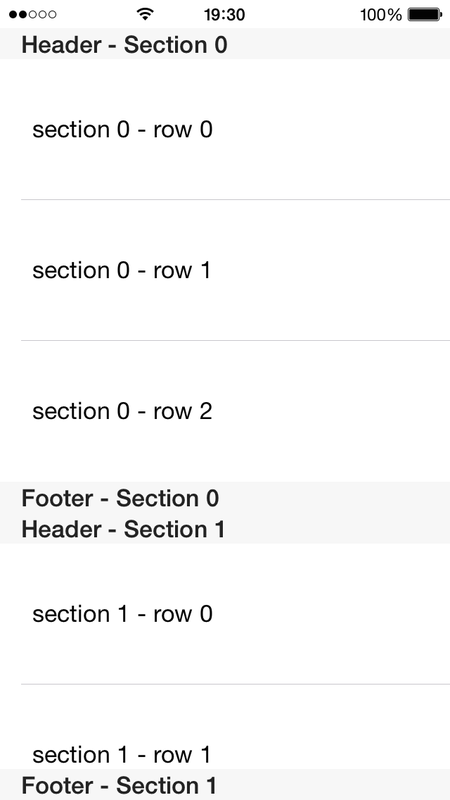 In your tableview you have 2 types of footers: one is the section footer and the other is the tableview footer. As you can figure out by the name, the section footer appears below of each section. On the other side, the tableview footer appears just once at the end of the tableview. That tableview above has in total 4 sections, each one with 3 rows. 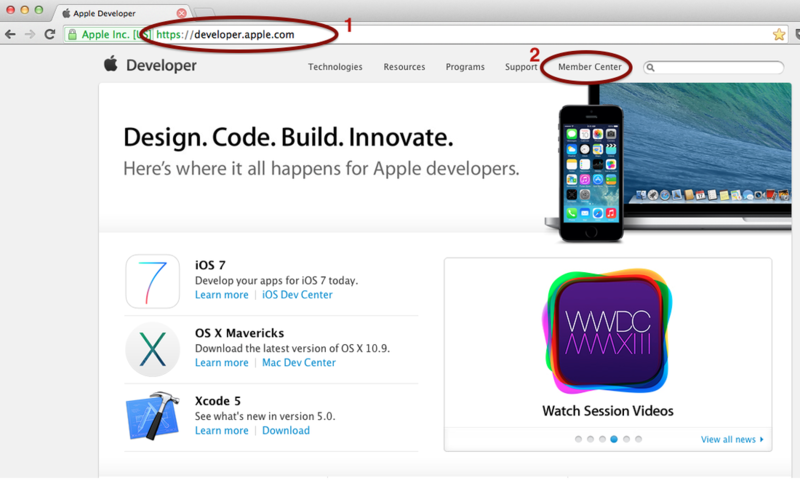 That behavior sometimes is not expected by a developer, which expects the footer to behave as any other cell. So, if you want a footer that is always the last cell of your section and does not show always on the screen, you need to do some workarounds. One workaround is to simply add 1 extra cell to each section and treat that cell as your footer. Other workaround (I did not personally test it, but heard from others that works) is to use tableview with static cells, which appears to not stick the footer to the tableview. Of course, all these workaround requires some coding to work properly. As you can see, I am using as the tableview footer a (empty) View with a green background. Now, let's see how I created these headers and footers. The sections headers and section footers are added via the delegate functions while the tableview footer is added by creating a UIView and setting that view to the tableFooterView property of your tablewView. So, the tableview footer is the first set of green code above. The headers and footers and the other set of green code. I just used the delegate functions to add a title to the header and footer. That is it. 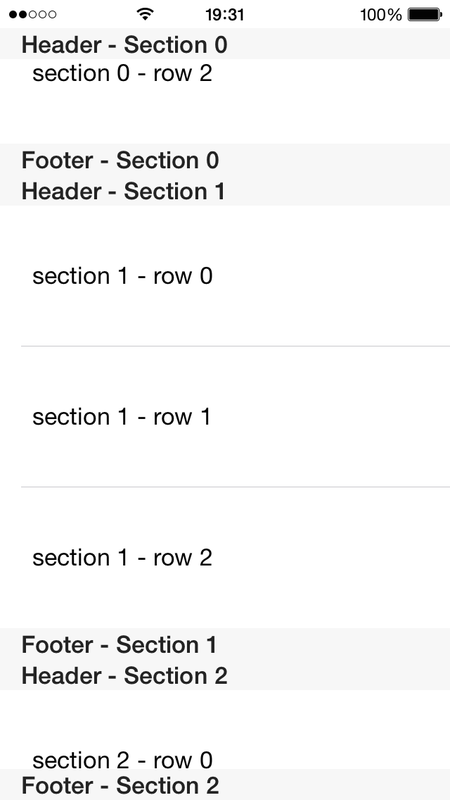 I hope this post help you better understand the section header/footer and the tableview footer. If you are new iOS developer looking on how to create a UITableview, the code above is only part of your need. So, don't freak out if you don't understand. To learn the basics of creating a UITableView, I recommend you take a look for tableview tutorials on Youtube. Here is a simple one. Self-publish or go with a Publisher? We recently were deciding if we should go with a Publisher to our new game. So, I have been reading lot and chatting with people about the advantages and disadvantages of using a Publisher. During my research, I found this great video that talks exactly about it. Enjoy. The following video shows an study made by Amazon on what differentiates their top 50 grossing apps from the rest. It is a must see video. What are Imagesheet and Sprites? If you are starting in game development, you may find yourself lost in some terms that you never heard before. In this post I will talk about 2 of them: Imagesheet and Sprites. As you can see, inside of 1 image file there are several independent image files. In this case, all independent images are of a boy, but it could be any other image (like bird, lamp, boy, ... everything together in 1 file). Why would I use an Imagesheet? There are mainly 3 reasons. The first reason is performance. Loading an image is an operation that access a file, so it degrades performance. One way of dealing with the performance issue is pre-loading all images when your app/game starts. You could do that by loading each image file, but imagine doing that for 50+ image files? 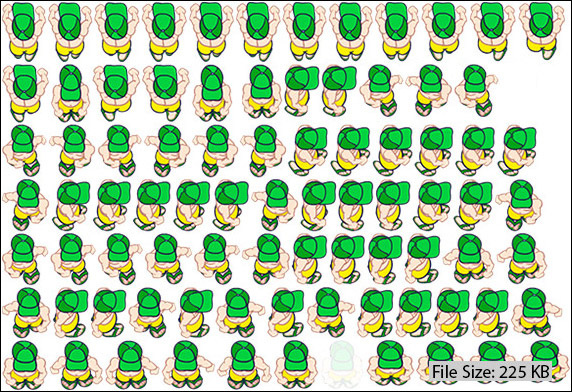 It is much easier if all these images are inside of just 1 image file, so you do only 1 image loading. The second reason is optimizing file size. Having several images inside of just 1 image file allows a better use of image compression, resulting in smaller file size. The third reason is to create animation. If you noticed, the images inside of the imagesheet above are frames of the boy walking. If you go thru these images within a certain speed, you will see the boy waking. That kind of animation using an imagesheet is what we call sprites (we talk about sprites just below). How do I access an image inside the imagesheet? That depends on the coding language that you are using. But the main principle is always the same: you pass the imagesheet file and some extra information about the position of the image that you want. As mentioned above, we usually refer to sprites as set of images that together create an animation. Each image that is part of the total animation is called frame and when we pass thru the frames at a certain speed you see an animation. Below is the animation of the boy walking. It was done using the imagesheet above using the first two images of the 3rd row, at the speed of 2 frames per second. You can create a imagesheet manually by putting all your images together in the same file, but doing that way is time-consuming and you will not benefit from compression improvements. So, there are a lot of tools that you can use to create a imagesheet, These tools makes you life easier and you just need to pass the image files and it creates the imagesheet for you. One software that I like and use is the TexturePacker. It is very simple to use and it also allows you to create imagesheets directly from swf files. I recently saw a video about PR Hacking, which talks about a different strategy to get PR about your product/startup. Basically, it tells you to approach the media not only with information about your product, but trying to relate your product with something that media might already be interested or looking for to write about. In the video, is given two examples, both very interesting in terms of the strategy used but mainly about the outcomes. I will summary the first example for you. The first example is about a startup/app called Klooff, which is basically a Instagram focused on pets. So, the user takes a photo from his/her pet and uploads it using the app. Trying to get media about such type of app may not be easy, since the market is overloaded with Instagram-type apps. So, after some brainstorming, was decided to relate pets with relationships, which is a topic which the media is much more willing to talk about that. They tried to find some survey about what a dog breed can say (or at least gives the impression) about his owner. They didn't find any so they did one survey but their own. With the survey result, they approach the media and had a great coverage. For more detail about that example, just watch the video. That method of trying to get PR is interesting, but as you can see, can be very demanding also. But in any case, you now have one more way to think about your PR. Nowadays, the use of SSL on your website or internet communication is a must. So, in this tutorial I will show the common types of SSL and how can you add it to your website. SSL means Secure Sockets Layer and it has the objective of protecting (via encryption) your communication over the internet. If you use internet banking, you should be familiar with seeing a "Lock" icon on your browser, indicating that your communication is secure. This is usually done automatically when you access your bank website using httpS instead of the normal http. This happens because the browser identifies that the server is using a SSL certificate issued by trustful company (called Certification Authority - CA). You can create own your SSL certificate (instead of one issued by a CA) but the browsers would not recognize you as one of their trustful companies, so even thought the communication will be encrypted, the "lock" icon will not appear and probably an alert will be given by the browser to notify the user about that. So, having a SSL certificate issued by a CA is the best way to show to the users/visitors of your website that their communication is secure and your website belongs to you. To have a SSL certificate issued by a CA, you just need to go to a CA website or one of its representatives (usually the Domain Providers are) and buy one. The CAs sells different types of Certificates, each one with different objectives and types of verification and even warranty. For our purposes, we will restrict ourselves to Domain Validation purposes, that is when you just want to have your domain using a SSL Certificate issued by CA without further validation (like Organization validation). A SSL Certificate can be issued to validate 1 domain (like www.redbeachgames.com) or several domains. So, CAs have several packages with different prices. One package that is pretty common is the Wildcard SSL certificate, that is when 1 SSL certificate can be used for validating any subdomain variation, like redbeachgames.com, www.redbeachgames.com, news.redbeachgames.com,.... Usually we indicate wildcard domain using "*" as *.redbeachgames.com. SSL Certificate price varies a lot among CAs. So, I recommend you to do a extensive search to find the best cost-benefit for you. The place that I found to have the best price was on Namecheap that is a Domain Provider that sells SSL certificates issued by several CAs like Comodo, Verisign,... The SSL certificate is totally independent from where is your domain is parked, so you can have a domain from GoDaddy and buy the SSL Certificate from Namecheap, after all, what matter is the CA issuing the SSL Certificate and the provider that is running your webserver/webpage. Just to give you a range of price, you can buy a single domain validation for ~9/year or a wildcard domain validation for ~$95 / year. You may think: "So, if I have 10 different subdomains or less, it is better to buy separate certificates instead of 1 wildcard certificate". That might not be true. Some website providers also charge you for using SSL. Example, right now Windows Azure charges $9 per month (prorated hourly) per certification. Besides that, having several certificates just add more work, since you will have to manage them all separately. 3) The CA will send you the Certificate. Now, you just need to configure your server to use it. Prices varies a lot. I found that if you buy the SSL directly from the CA website you might not get the best price. Usually Domain Providers sells SSL issued by CAs and they have a better price. As mentioned before, the place that I found to have the best prices was Namecheap. And their customer support is also great. After running the command above, you will be asked some information that are straight forward to be filled. The only attention that you need to have is when filling the "Common Name" that should be filled with the website address that you want to use the SSL like "www.redbeachgames.com". If you are using a wildcart SSL, you can fill it with "*" in the subdomain, like "*.redbeachgames.com". This is step is usually pretty simple. Usually the company from you bought the SSL certificate (the CA or its representatives like Domain Providers - GoDaddy, Namecheap,...) will ask you to upload or simply paste the CSR content on its page. If you used the command above, your CSR will be the file server.csr. Each server has its own way of being configured to use the SSL, so I suggest you to look on your server provider for instructions. If you are using a Windows Azure Website, you can find the instructions here. That is it. Hope that you find this tutorial useful. If you want to know more about a specific tech/mobile topic, just let me know on the comments. Did you know that when you download an Android App from Google Play or Amazon Store, you are actually downloading 1 single file? That file has an APK extension and it is a kind of zip file. In fact, if you rename the extension from APK to ZIP and extract it, you will be able to navigate thru its asset files (images, audio,...). But unzipping the file does not make all its content accessible. E.g, if you try to open the AndroidManifest.xml, you will see that its content is not on plain text. So, if you want to correctly unpack all files from the APK, you can use a tool called apktool. 1) Download the apktool file and its system dependency file, both available for free here. (For example, If you are using an MAC, you will have to download: apktool1.5.2.tar.bz2 and apktool-install-macosx-r05-ibot.tar.bz2). That is it, the apktool will have created a new directory with the same name of your apk file where you will find the apk content. If you want to pack that directory back again into an apk (let's say, after you edited something), just use the following command: "./apktool b [apk dir name] [apk file.apk]"
Important note: when you unpack and pack back the apk, it loses its android signature. So, if you want to install that apk on a device, you have to sign it again using the android Debug Key or your own key. You can do that by running the following command: "jarsigner -verbose -keystore [your keystore file] [your apk file.apk] [your keystore alias]"
Today I will be showing you how to set up AWS SNS. The Amazon Web Services (AWS) Simple Notification Service (SNS) is a service that allows developers to use the AWS infrastructure to send Push notifications to devices (it can also be used to send SMS or messages to other services like the AWS Queue, but these are not in the scope of this tutorial). Push notification are those messages that smartphone/tablet users receive that popups in the device screen. They are called as "Push" because it is the server that pushes the message to the device and not the app that requests the message from the server. #1) Log into your AWS Management Console and click on "SNS Services" under the "App Services" category. #2) In the SNS dashboard, select the Region that you want to use for the SNS Service. Theoretically, you should select a region that is closer to your end users. We will be using N.Virginia for this tutorial. #3) Click on "Add a New App"
#4) Fill the required info. Push Platform: You need to choose what platform will this SNS use. 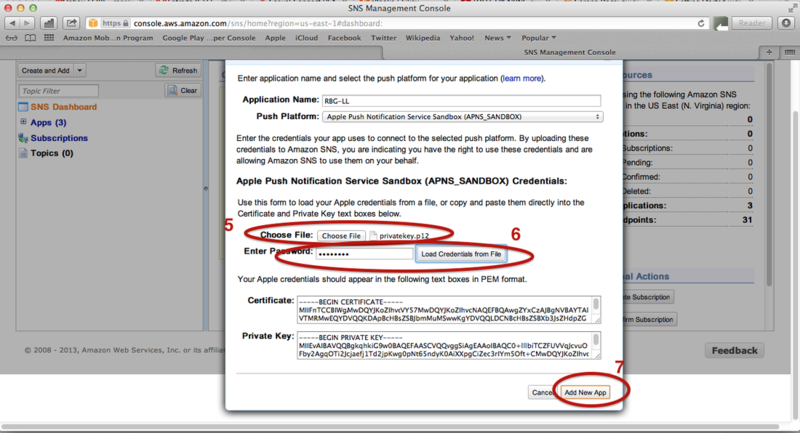 If your app is an iOS app, you need to choose the Apple Push Notification Service (APNS). 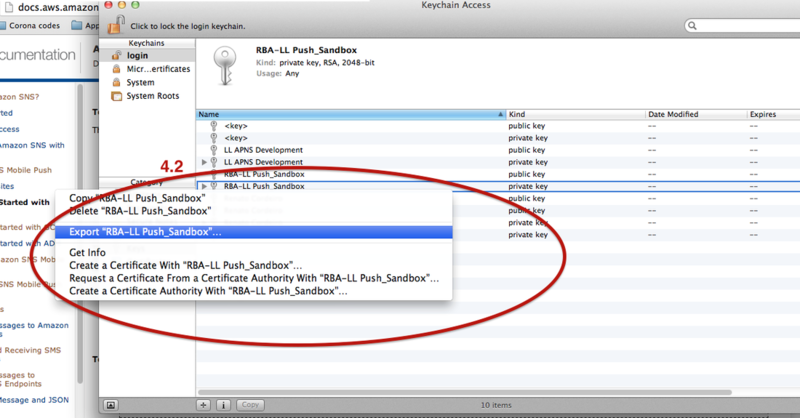 During development, it is recommended to use the Apple Push Notification Service Sandbox (APNS_Sandbox). You also have the option to choose the Google service or Amazon. We will choose here Apple Push Notification Service Sandbox. Credentials: in this section you will have to enter the credentials of the Push Platform selected above. On the APNS, we need to enter the Certificate and Private Key. We can enter them directly in the box or we can simply select the P12 private key file and the Certificate and Private Key info will be automatically filled. Let's do it by the simple way (choosing the file). You probably are asking "Where is that p12 private file??". It is probably nowhere yet. 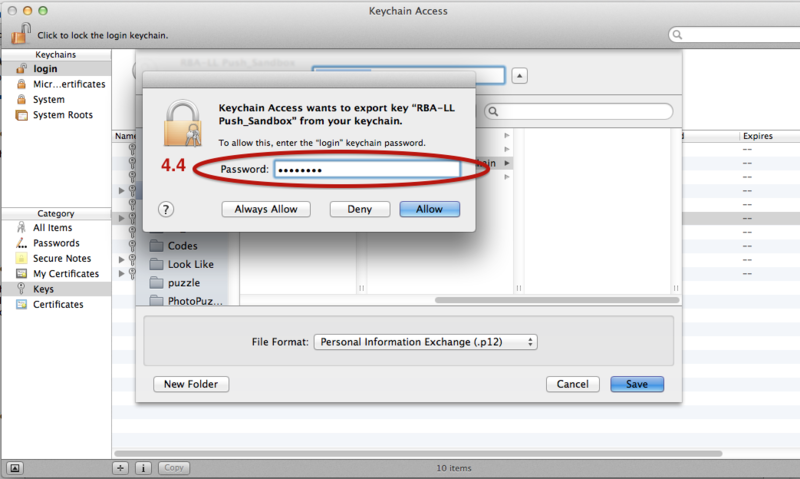 We need to export it from the Keychain Access of your MAC developer machine. Of course, you already need to have it installed in your MAC, if you don't have it, please read my previous post on "Enabling Push Notifications for an iOS app". Let's export that private key then. 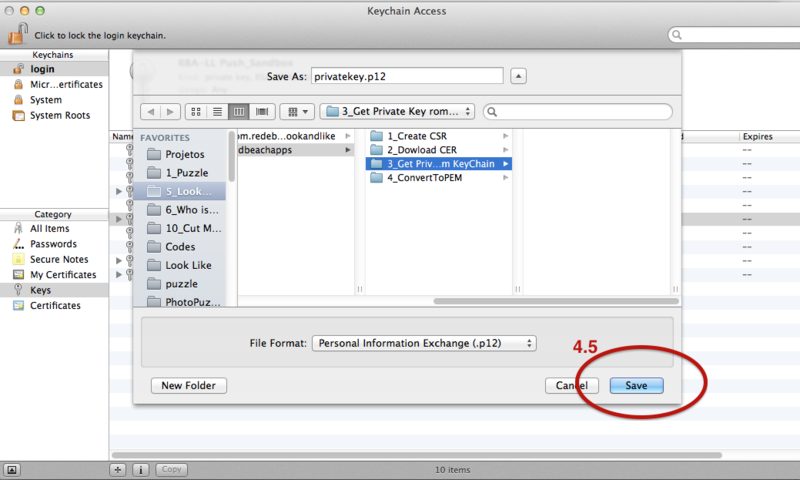 #4.1) Access your Keychain Access and select "Login" in the Keychains#4.2) Make a right click on the correct app private key and select Export. #4.3) Set a password for the file. 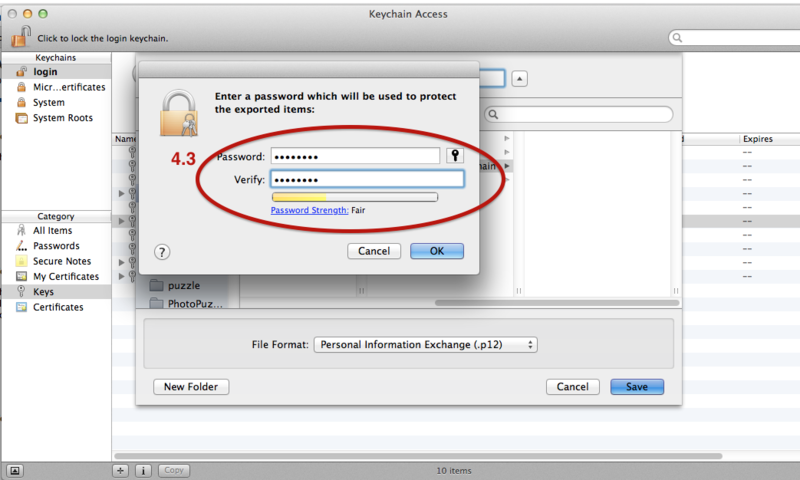 #4.4) The system will ask for you MAC login password before exporting the file. $4.5) Save the p12 file somewhere. #5) Now, go back to the AWS SNS New App screen and select the private key that you just exported. It is a p12 file. #6) Enter the password that you set on the item #4.3 and press "Load Credentials from File"
#7) Now, just click on "Add New App"
That is it. Now you have set the AWS SNS to send Push Notifications. You maybe thinking: "Ok, but how do I send a Push message?". Well first you need to register the device that will receive the Push Notification with the SNS service. In SNS Dashboard of the app that you just configured, you can see the devices that are registered to receive the Push Notification. Since, we just configured the service, we have none. You need to make your app (in this case an iOS app) to register the user iPhone/iPad with the SNS Service. You do that by passing the device push token that Apple will provide to your app. If you already have that token and just want to test the SNS Service, you can add it manually by clicking on "Add Endpoints" (Endpoint in our environment here is a user device). The EndpoinArn info that you also see in the console is like the "AWS SNS token" for that device. After you add a iOS device token, the SNS you create a EndpointArn. To send a Push notification to that device, just select it and go on "Endpoint Actions -> Publish". Just type the message and click on "Publish Message". If you set everything right, you should receive a Push notification on that device. Of course, sending Push Messages manually for you game/app is not very fun. So, you need to have a server and configured it to communicate with the AWS SNS and send the messages for you. AWS has SDKs for several languages (.NET, PHP,...), so you can get the SDK go thru their documentation to configure your server. That is it. Hope that this tutorial helps you and if you want to know more about that or other mobile topic, just let me know. 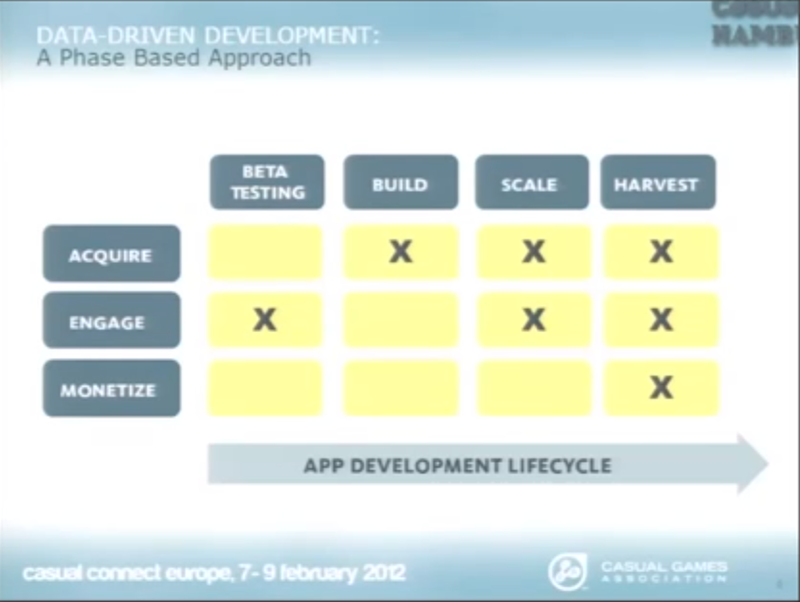 When developing your mobile app/game, you know that you have to keep in mind several design aspects, specially engagement (retention), acquisition and monetization. There is a very famous framework called ARM (Acquisition, Retention, Monetization) that says that you first need to focus on acquiring users, then engage them and only for last try to monetize them. After all, does not make sense to monetize an app/game that does not have a minimum number of DAU (daily active users). I have a problem of the ARM. At same way that it correctly poses that does not make sense to monetize before you have a "steady" user base, I don't think that makes sense to acquire users if your app/game doesn't provide them with an good experience that would makes them return to it again. So, I prefer to act in a RAM framework (not it is not the memory :) RAM = Retention, Acquisition and Monetization). If you have some free time, you can watch their full presentation below. On my next post I will talk about setting up AWS Push services so you can use it with your mobile app/game. Push Notifications are a powerful tool not only for you to communicate with your users but also to let them communicate with each other. In this tutorial I will show you how to enable an iOS app to receive Push Notifications and in the next tutorial I will show you how to configure the AWS (Amazon Web Services) SNS service to send Push notification to an app. So, let's start the step-by-step tutorial. 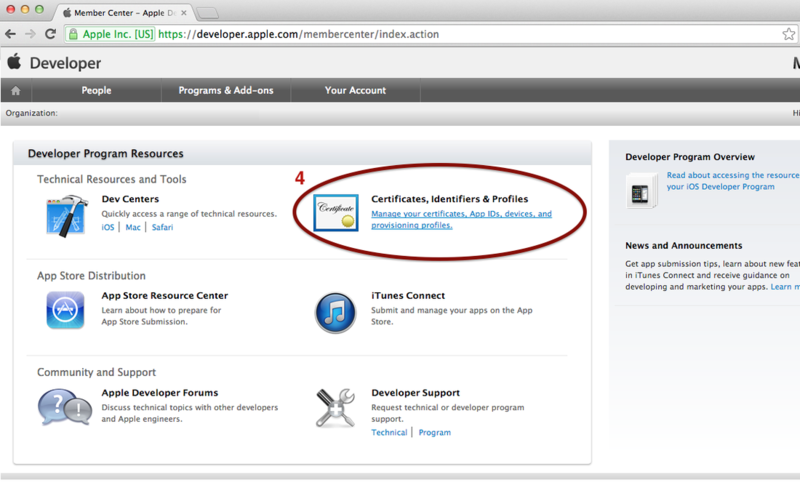 #2) click on "Member Center"
#4) Select "Certificates, Identifiers & Profiles"
#9) Now you need to create a certificate. You can create a "Development Certificate" that is for you to use while developing your app or create a "Production Certificate" that is when your app is already done and you are going to publish it on the store. Here I will be creating an "Development Certificate". #10) The process of creating a certificate begin in your local computer (that needs to be a Mac), by creating a Certificate Request. To create that you just need to follow the steps described on the image. #11) After creating the Certificate Request, press "Continue". #12) Now we need to upload the Certificate Request that was just created. #13) Then click on "Generate" to create your Certificate. #14) Then just download the Certificate if you want it. You can always download it later on the "Certificates" section of that page. After these steps you have enabled your iOS app to receive Push Notification. But, how do you actually send the notifications to the device? Well, that is subject of the next tutorial where I will show you how to set up the AWS SNS that you can use to send the notifications to the devices. This blog it not updated anymore.